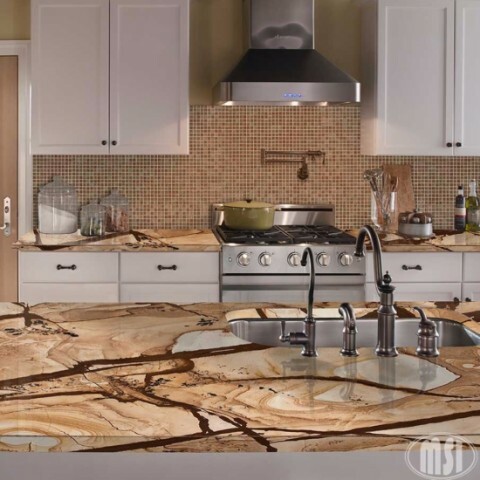 A lively countertop like the one pictured goes best on uncomplicated cabinet styles and the surfaces pictured are obviously the focal point of the room and nothing else should take away from them. 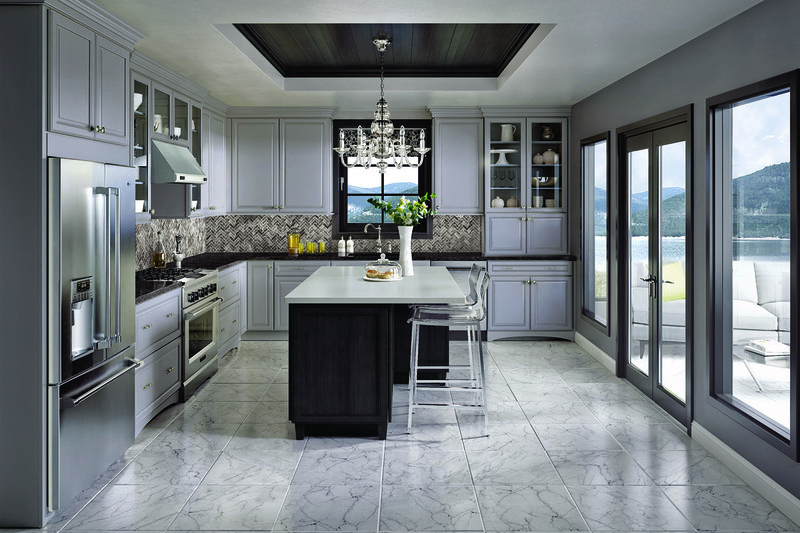 Leave off the glazed finishes and ornate moldings so your eye is instantly drawn to the countertops. The simplicity of Merillat Classic’s Portrait or Fusion door style would work well with a jazzy surface like this. The large number of choices may be exciting, but it’s important to pay attention to the overall effect. If you choose one finish color for the island and a different one for the perimeter, you can tie it together using the same countertop throughout. The kitchen pictured is a good example. 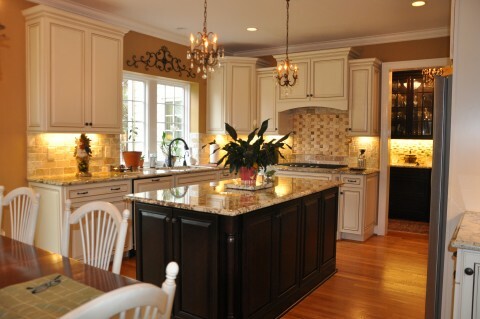 The colors in the countertop coordinate with the painted perimeter cabinets and the dark-stained island. Flip that rule over if you’re thinking about using two different countertop materials together. Consider using only one cabinet finish if you decide to use two different countertops on the island as opposed to the perimeter of your kitchen. If you’re just burning to use two countertop and two cabinet colors, choose a natural material like Pink Juparana granite for the island and something calm, like Caesarstone’s Sleek Concrete for the perimeter surfaces. Look for a neutral countertop color with a low-key pattern; you don’t want the two materials to fight each other. 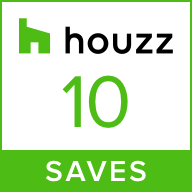 This rule is important when the island and perimeter cabinet colors are different. It’s best if there’s one consistent element, like the island, that becomes the starting point for everything else. 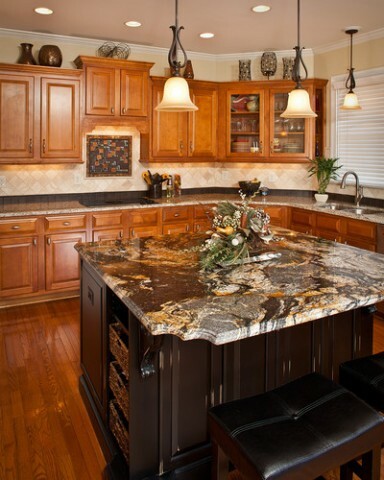 Pulling in two finishes and two different countertops can also work if you make sure it balances. A pairing of black and white creates a contemporary style, especially when you include sleek, streamline appliances. You can coordinate Silestone’s Iconic White quartz countertop with a cabinet finish like the Merillat Masterpiece Peppercorn on cherry for the island cabinets. In combination with that, use Caesarstone’s Jet Black quartz countertop on a cabinet finished with Merillat Masterpiece’s Canvas to complement the perimeter. Come see us at Carolina Kitchen & Bath; we offer a wide range of cabinets, finishes and countertops for you to pick from. Our designers are ready to help you navigate the choices you have to make, so matching and coordinating colors for your kitchen doesn’t seem so daunting.